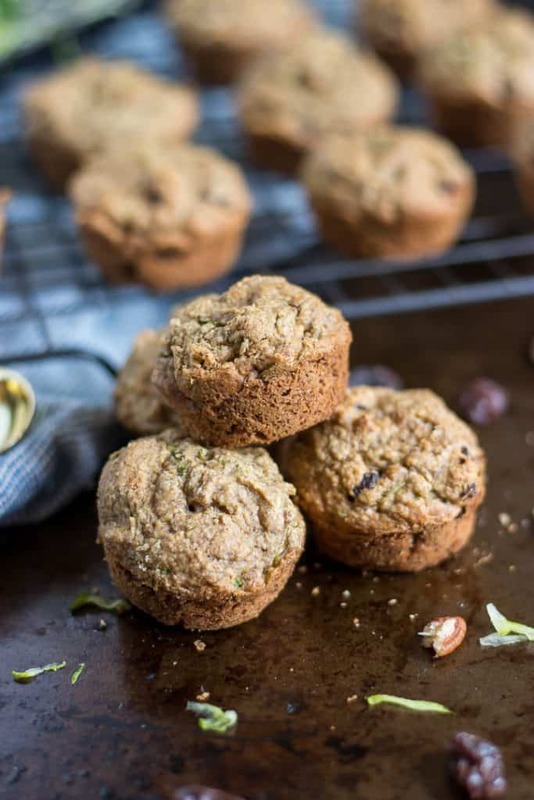 These poppable Flourless Zucchini Mini Muffins are packed with hearty oats, freshly grated zucchini and banana–perfect for snacking or a quick breakfast on the go! When it comes to comfort food, zucchini bread is where it’s at for me. We have a family recipe that has been passed down that is to die for. I used to love when the farmer up the street brought us some of his harvested zucchinis because I knew what was coming! There was nothing like a warm, thick slice with melted butter after dinner. I loved the end piece, perfectly browned and I also loved my zucchini bread loaded with raisins. Plump, juicy raisins baked into any sweet bread are a win for me. I have lived a life of ups and downs with food. We have been friends, enemies and everything in between. The concept of comfort food is a tough one for me. I have tried to find balance and a happy medium when it comes to food in the fact that I don’t want to use food as a security blanket. I try to make sure that my emotions are untied to what I eat. But it is so true that food is naturally tied to comfort, memories and above all, emotions. The smell of pumpkin pie brings me straight to my grandma’s kitchen at Thanksgiving. Yellow Peeps bring back memories of my other grandma. Lasagna takes me to a warm cabin in Gatlinburg with the entire Italian side of my family—comforting, but certainly not a quiet memory! And zucchini brings me to the kitchen with my mom learning to bake the family recipe. Food and emotion cannot be separated completely, and I have made peace with this idea. The sense of comfort that I have found to be more positive in my own life in relation to food is in those that connect us to memories, loved ones and special times. These are the foods that one bite takes us straight back to grandmas or Christmas or to a friend’s house. This emotion does not cause us to eat in a way that numbs us or avoids feeling. Rather, these foods encourage feeling. For some, a bite of apple pie can bring tears as memories of grandma come to the surface. These are the comforts that make comfort food something we still need and desire. Today, I can come back to those fond kitchen memories with my mom, and make up some of these Mini Muffins! I have had soooo many extra ripe bananas that I just haven’t known what to do with so I have been trying to get super creative with them. I used oat flour made from processing oats in the blender into a flour. 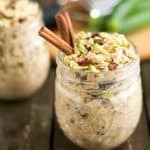 You can also buy the flour at the store but since you can easily make your own oat flour, save your self some cash and throw some oats in the blender. Other than that, enjoy! 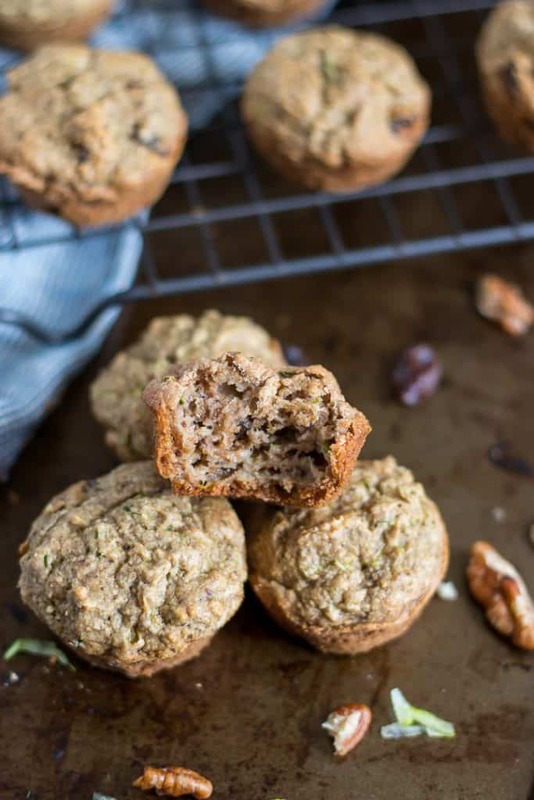 These poppable Flourless Zucchini Mini Muffins are packed with hearty oats, freshly grated zucchini and banana--perfect for snacking or a quick breakfast on the go! In a food processor or blender, combine banana, egg, milk, maple, and vanilla and blend until smooth. In a small bowl combine and stir all dry ingredients. Fold in raisins and zucchini and stir to combine. 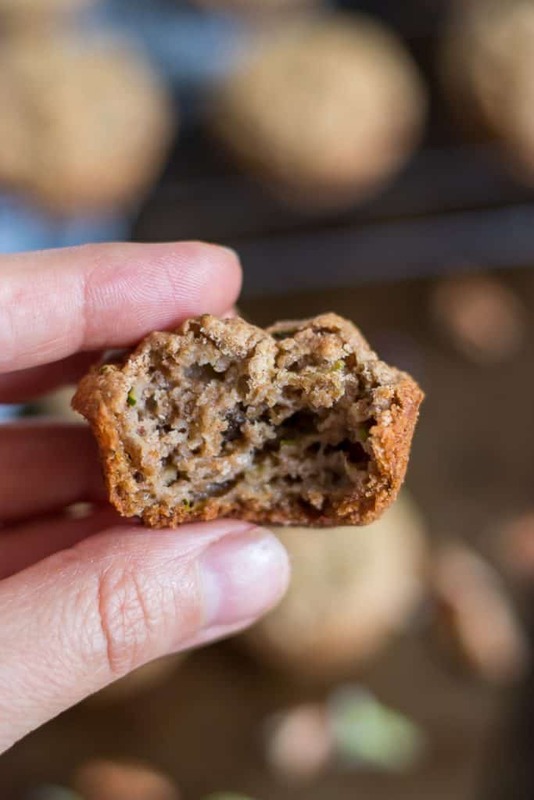 Pour into lined or lightly greased mini muffin pan and bake for about 20 minutes or until you can poke with a toothpick and no residue is left. 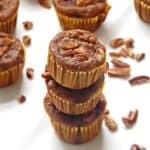 Feel free to add in pecans, walnuts or other add ins you may like! 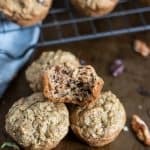 Wound these work in full size muffin pans? This sounds delicious!!! Yes! You’d just have to cook them probably about 40 or so minutes! I need to make this asap, I think I have all the ingredients! That’s half the work most of the time! Food is so special for memories and comfort, indeed! And I love making my own oat flour, such a $$$ saver! I love that these are naturally gluten free, and of course, that they feature a delicious vegetable. Can’t wait to try this with my homegrown zucchinis! I didn’t grow zucchini this year and now I’m so wishing I did! 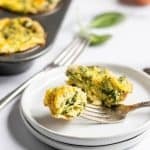 This recipe is a great way to hide zucchini for picky eaters and makes a perfect snack or lunch side for kids for school and even when they are off for the summer months! Seriously no one ever knows the zucchini is even in there!